These Fountains are a great addition to any landscaping project. 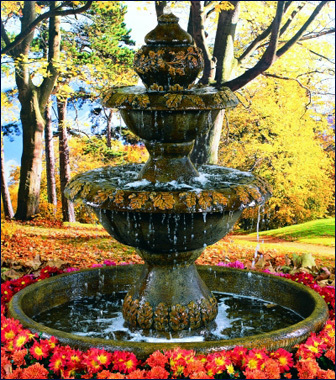 Landscapers and home owners looking for Outdoor Fountains, Wall Fountains, Outdoor Garden Water Fountains for my garden or home, deck or patio, you have come to the right place for water gardening landscaping ideas.The success of a Water Garden Fountain is all about its coordination with the plants, location, and variety. Take a good hard look at your landscape and try to pinpoint a theme. Is your garden all-American, European, or Asian? The fountains must complement its environment, for years to come with enjoyment and beauty and hopefully these suggestions have been helpful in initiating the creative process. See picture on left of our 239-FB Roma Water Garden Fountain with all the elements that make a garden fountain beautiful. Elite fountains backyard water fountains are a great way to add interest to your backyard design. Water has a mesmerizing effect on us, listening to the sound of water gently splashing in a fountain can put you in a relaxed mood quickly. There is also an element of visual interest, which is part of the relaxing effect as well. As you watch the water make its way through the fountain, and watch the ripples and bubbles – your mind gets taken away from your worries and you get to a quiet and peaceful place. Some Backyard Water Fountains have intricate and ornate details. Some have statues or figurines integrated into their design. Some are more elegant and simplistic. Find the right design and size from Elite fountains to complement your existing backyard design ideas, or start with a fountain and build the rest of your design around it. Either way, you won’t regret adding your own backyard water fountain for your home or garden. 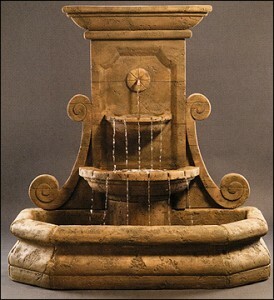 Searching for Wall Fountains for my Garden area: See picture on left of our Grande Volute Wall Fountain #2084-fw. Elite fountains has so much to offer. 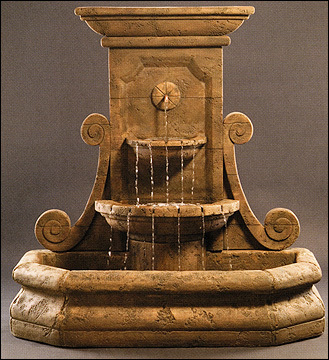 Our large selection of Wall fountains make a grand focal point in any entryway for your garden, Landscaping, home interior or office. Our concrete fountains are made of the highest quality craftsmenship to give you years of enjoyment. Each fountain piece is hand finished from your choice of a variety of stains and washes, then refired to protect the finish. Outdoor Wall Fountains run on either an electric pump or solar power. They come in a range of sizes and styles, to suit all kinds of garden themes. Tiered cascades, wall mounted and traditional pedestal designs are some of the many options available. Designs based on mythical figures, animals and cherubs are popular, as are more contemporary designs. Having a wall fountain not only adds to the atmosphere of relaxation and calm, but also helps keep the water circulating and prevents it from becoming stagnant. A centerpiece fountain is usually most appropriate for a large outdoor space. Consider using a centerpiece fountain as a focal point for your garden design. Often centerpiece fountains are sculptures, so consider them as works of art and choose an outdoor garden fountain that you will enjoy and that makes you feel good to view. Usually centerpiece fountains are made of stone, cement or resin. Also Outdoor Garden Fountains can be used in a smaller place such as a patio garden, but only if the primary use of the space is not impeded by the fountain’s placement. For example, if children play in the space or groups of adults gather for drinks and barbecue, a fountain in the center is probably a bad idea. However if the patio is used for reading, tiny gatherings, or just observing the sunset, a fountain may be the perfect accent. Elite World of fountains presents their new video “The Fountain.”The country cabin store did a great job setting up the inventory! Showing the video below, of setting up our Massarelli’s Fountains and Animal statuary!